Watch our video recipe below to see how to make it! Scroll down for the full recipe. We hope you enjoy! Heat a skillet over medium high heat. Once hot, melt the butter. Add 1 tortilla to the pan and top with approximately 1/4 cup grated cheese (or enough to spread in a single layer across the tortilla). After about 1 minute, add the black beans, bell peppers, and tomatoes. Cook for 1 minute. Add the remaining grated cheese and put the other tortilla on top to create a “sandwich”. Allow the cheese to melt for 1-2 minutes. Carefully flip the quesadilla and cook until the bottom of the tortilla is nicely browned and the cheese has melted. Check out the What a Good Eater! cookbook for fantastic ideas on family friendly meals, sample food schedules and menus by age, healthy snack ideas by age, and meals ready in about 30 minutes or less for busy parents. 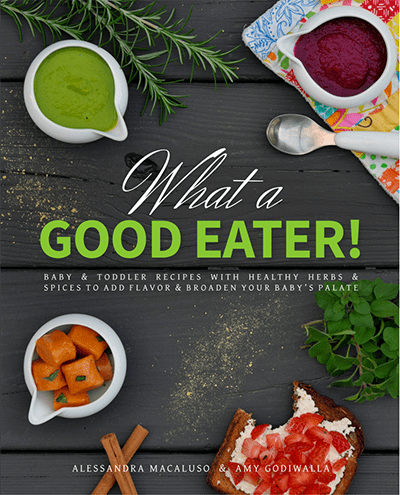 Amy Godiwalla is co-author of the What a Good Eater! cookbook, available on Amazon. Amy and her husband, Shaun, live in Denver, Colorado, with their two little boys. When Amy is not feeding little mouths or inventing recipes, she enjoys hiking, yoga, snowboarding, cooking, entertaining, traveling to the mountains, sipping hot chocolate at ski resorts, and wine tasting. Pick up a copy for yourself or for a friend - these also make great gifts! How to Handle Kids Obsessed with Sweets: What a Good Eater Podcast on	The Wide World of POPS! Thanks so much for the information!